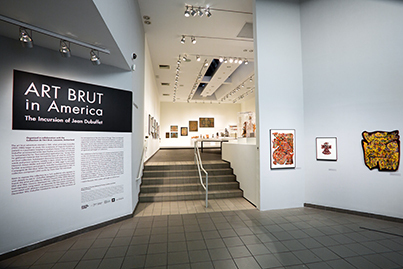 Art Brut in America: The Incursion of Jean Dubuffet is the first major U.S. exhibition to explore the introduction of art brut to America. 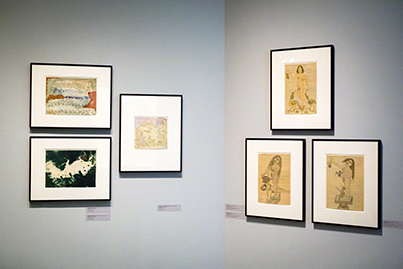 The nearly two hundred works of art on view, by both canonical and lesser-known art brut figures, were amassed and identified as art brut by French artist Jean Dubuffet, beginning in 1945. 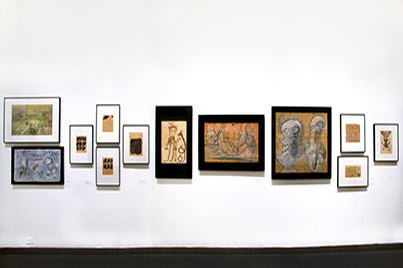 The selection is drawn exclusively from the renowned Collection de l’Art Brut in Lausanne, Switzerland, where Dubuffet donated his collection in 1971. 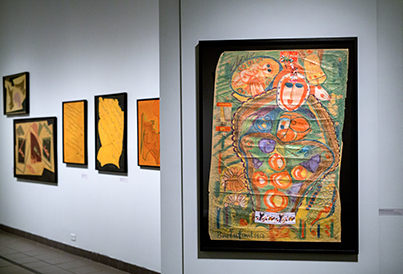 The exhibition reflects on two seminal but unexplored moments in mid-twentieth century America: between 1952 and 1962, 1,200 works from Dubuffet’s art brut collection were displayed in the East Hampton estate of his friend, the artist and collector Alfonso Ossorio. 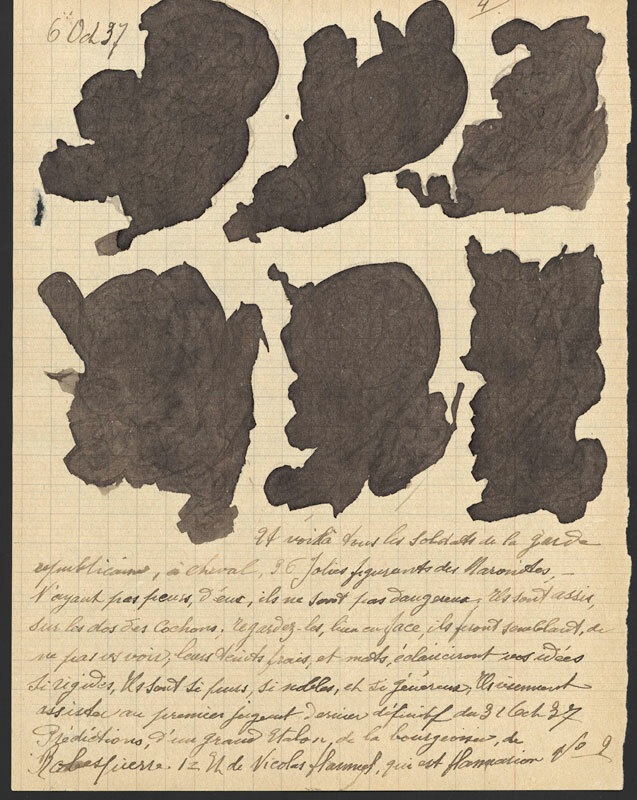 Slightly prior to their installation, in December 1951, Dubuffet delivered a provocative speech titled “Anticultural Positions” at the Arts Club of Chicago, which challenged established ideas about art analysis and modes of creation. 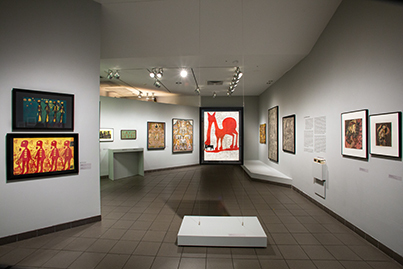 Organized in collaboration with the Collection de l’Art Brut, Lausanne, Switzerland. 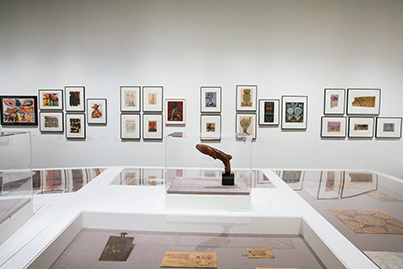 Curated by Valérie Rousseau, PhD, Curator, Self-Taught Art and Art Brut, American Folk Art Museum. An exhibition catalog is available. 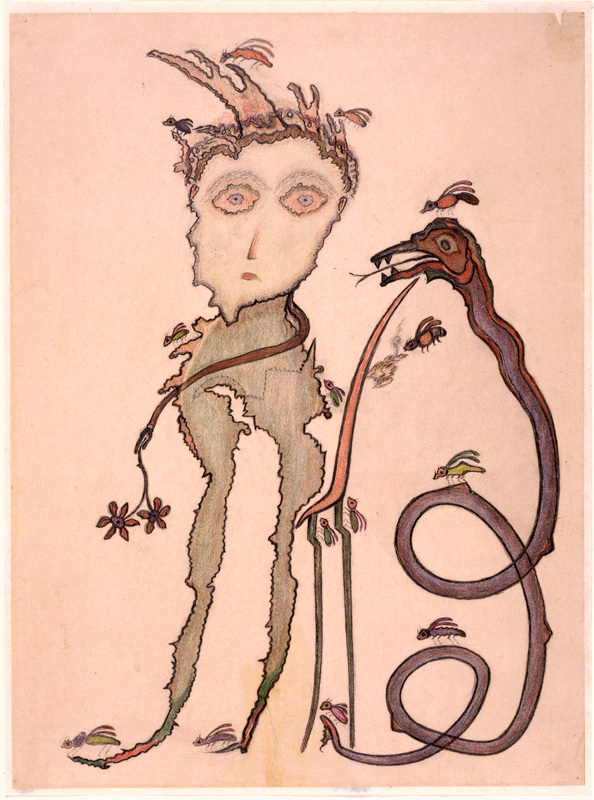 Heinrich Anton Müller (1869–1930), Untitled, c. 1927–1929, colored pencil on drawing paper, 22 5/8 x 16 3/4 in., Collection de l’Art Brut, Lausanne, Switzerland. 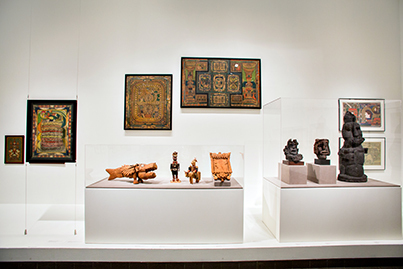 Photo © Collection de l’Art Brut, Lausanne, by Claude Bornand. Francis Palanc (1928–2015), Untitled, 1953, finely ground eggshells on canvas, 31 1/2 x 23 1/4 in., Collection de l’Art Brut, Lausanne, Switzerland. Photo © Collection de l’Art Brut, Lausanne, by Henri Germond. Jeanne Tripier (1869–1944), Petit dossier nº 10 (Little folder no. 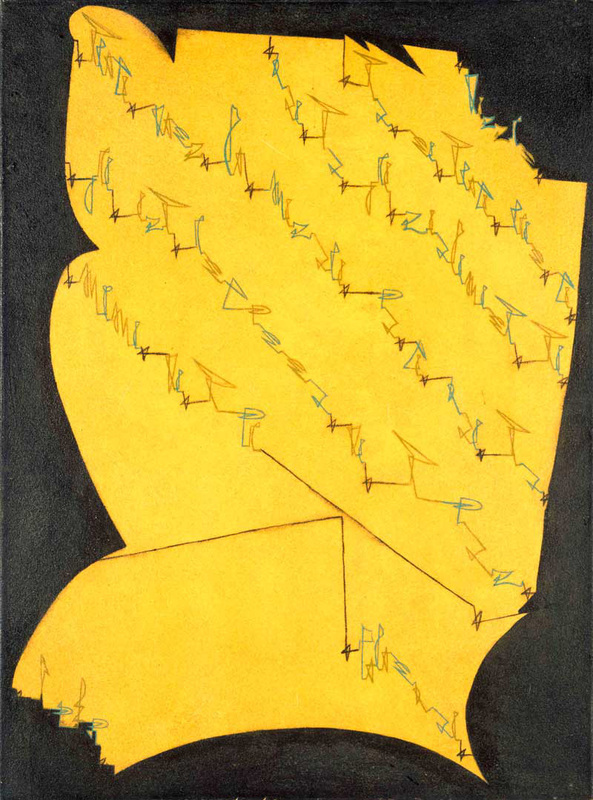 10), c. 1935–1939, ink, varnish, and sugar on paper, page size between 8 5/8 x 6 3/4 in. and 13 5/8 x 8 5/8 in., Collection de l’Art Brut, Lausanne, Switzerland. 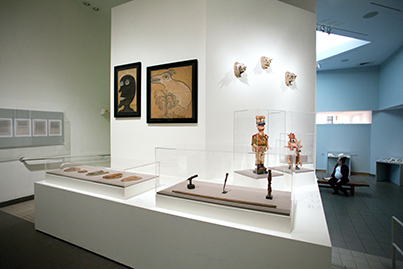 Photo © Collection de l’Art Brut, Lausanne, by Jean-Marie Almonte and Michael Legentil, Atelier de numérisation—Ville de Lausanne. 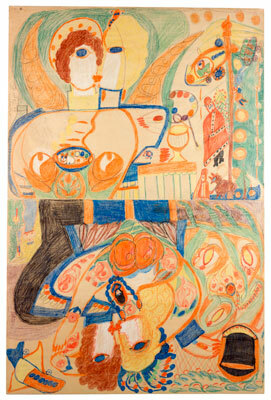 Aloïse Corbaz (1886–1964), Baptême de Pie XII / Un Baiser à l’aviateur – Le Pape Pie XII monnayeur et son Sphinx sur le siège (Baptism of Pius XII / A kiss to the aviator—Pope Pius XII counterfeiter and his Sphinx on the seat) (double-sided), c. 1955, colored pencil on a sheet of paper folded in the middle, 59 x 39 3/8 in., Collection de l’Art Brut, Lausanne, Switzerland. Photo © Collection de l’Art Brut, Lausanne, by Olivier Laffely, Atelier de numérisation—Ville de Lausanne. 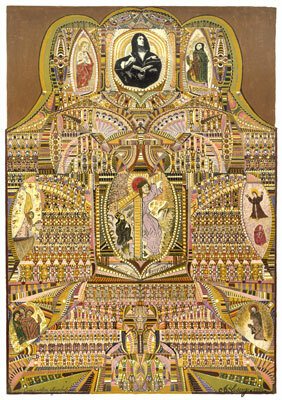 Augustin Lesage (1876–1954), Composition symbolique, amour pour l’humanité (Symbolic composition, love for humanity), 1932, oil on canvas, 38 1/4 x 27 1/2 in., Collection de l’Art Brut, Lausanne, Switzerland. Photo © Collection de l’Art Brut, Lausanne, by Claude Bornand. 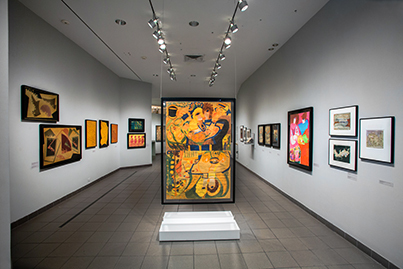 Major support for the exhibition is provided by the Horace W. Goldsmith Foundation in honor of Sam Farber (1924–2013), a devoted trustee of the American Folk Art Museum and a passionate collector of art brut and art by the self-taught. The exhibition is supported in part by Consulate General of Switzerland in New York, Joyce Berger Cowin, the David Davies and Jack Weeden Fund for Exhibitions, the Ford Foundation, the Leir Charitable Foundations, public funds from the New York City Department of Cultural Affairs in partnership with the City Council, the New York State Council on the Arts with the support of Governor Andrew Cuomo and the New York State Legislature, the Segal Family Foundation, and the Swiss Arts Council Pro Helvetia.